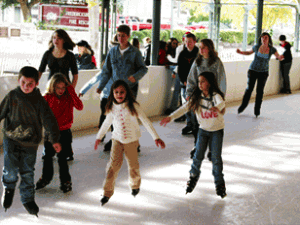 We don’t get a lot of cold weather in Fredericksburg, but every December we do have an ice rink, or eisbahn. Hours are Mondays – Saturdays 4:00 – 8:00pm; Fridays & Saturdays and School Holidays 10:00am – 10:00pm; Sunday 1:00 – 8:00pm and closed on Christmas Day. For $10 you can skate all day. The Eisbahn is open from November 28 until January 3.